QUEEN’S GRADUATES SEAMUS HEANEY AND SOPHIA HILLAN, A LONG LOST LETTER – AND TWITTER! The rightful recipient of a letter typewritten by the Nobel Laureate Seamus Heaney in September 1973 – discovered by Belfast man Stewart Law in a book he had purchased in a local second-hand charity book shop 8 years ago – has finally been identified. Thanks to the power and instant reach of social media, a tweet by Stewart Law took just 30 minutes to reveal the owner of the letter as Queen’s graduate – and close friend of the Heaney family – Dr Sophia Hillan, writer, lecturer and former Assistant Director of the Institute of Irish Studies at the University. Speaking to the BBC, Mr Law, who came across the letter recently during a clear out, said: ‘I use Twitter a lot and I thought if I put it out, I would be able to find the owner,’ he said. Dr Hillan, a former student of Seamus Heaney who would go on to become a close friend of the family until his death in 2013, has a number of English Language and Literature qualifications from Queen’s including a BA, a MA and a PhD. She also worked in the Institute of Irish Studies for ten years until she took early retirement as Assistant Director in 2003. On being advised of the tweet by a friend of her son, Dr Hillan replied to Stewart Law's original post saying: ‘Yes, it was to me! ‘I am the Sophia Hillan who was at Irish Studies and would love to have it back,’ she wrote. Speaking to Queen's about the letter, the first she ever received from him, and her friendship with Seamus Heaney, Sophia Hillan said:"In the summer of 1973 I was finishing my MA in English at QUB. The year before, 1972, I had graduated in English Language and Literature. Seamus had been one of my lecturers and, in the final year, one of my course tutors. He had the gift of teaching, expecting high standards of himself and his students, yet bringing out the best in us with guidance and encouragement. "A few years later, when I was married and living in Dublin, he brought me to work with him at Carysfort College, where he was Head of English. It was then, not least because we were near neighbours in Sandymount, that I got to know him and Marie, his wife, as friends." The 'Maeve' refered to in the letter, as Sophia points out, is Medbh McGuckian, also of the Class of ‘72, and herself, of course, a poet of great standing. "In those far-off days," added Sophia, "she spelled her name as Seamus writes it in the letter." The contact between former student and teacher continued when Sophia Hillan returned to Northern Ireland after her time in Dublin. "When I moved back North in 1983," Sophia continued, "it was he who advised me to continue at Queen's the PhD I had begun in Dublin on Seamus’s own early mentor, Michael McLaverty. Later, when I was Assistant Director of the Institute of Irish Studies (1993-2003), he generously gave his time to work with me on several large projects and conferences, though he was by then in constant demand. "When I finally returned to the writing of fiction, which I had left to one side when the academic life took over, he was once more a great encourager and supporter. We remained correspondents and friends to the end of his life, and of all the letters I had from him, I think I cherish most the last one in which he summed up our relationship as 'We have been colleagues in our time and friends for a lifetime'”. Since retiring from Queen’s Dr Hillan has published a number of critically acclaimed novels – The Friday Tree (2004) and The Way We Danced (2016) both by Poolbeg Press – as well as a number of non-fiction books May, Lou and Cass: Jane Austen's Nieces in Ireland and Study of the Work of Michael McLaverty. Mr Law’s tweet on 3 July received over 720 retweets, 1,300 likes and a number of comments – including one from Queen’s Special Collections, which helped point him in the direction of the letter’s owner. 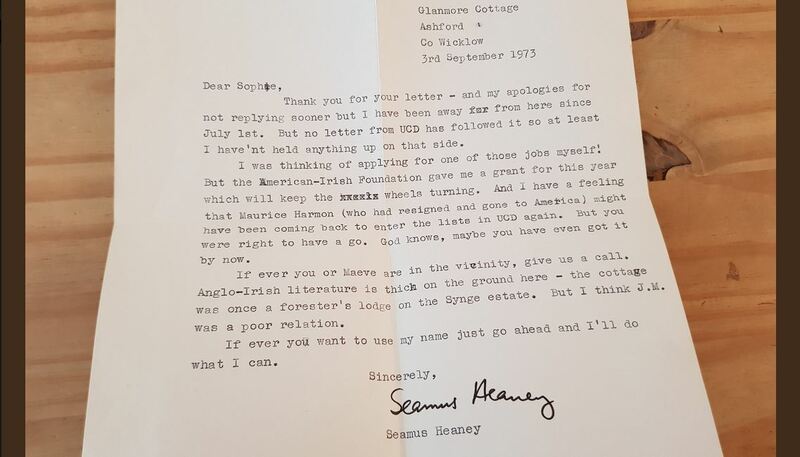 The significant letter, which was in response to Sophia Hillan’s request to her former tutor for a reference, re-emerged just days before an exhibition to honour Seamus Heaney was opened at the new Bank of Ireland Cultural and Heritage Centre by Irish President Michael D Higgins. Seamus Heaney: Listen Now Again is open to the public free of charge and will run for three years at the College Green exhibition centre in Dublin. Enquiries to Gerry Power, Communications Officer, Development and Alumni Relations Office (DARO), tel: +44 (0)28 9097 5321.